AWV :: Classification dot Gov dot Au site hacked, front page changed. 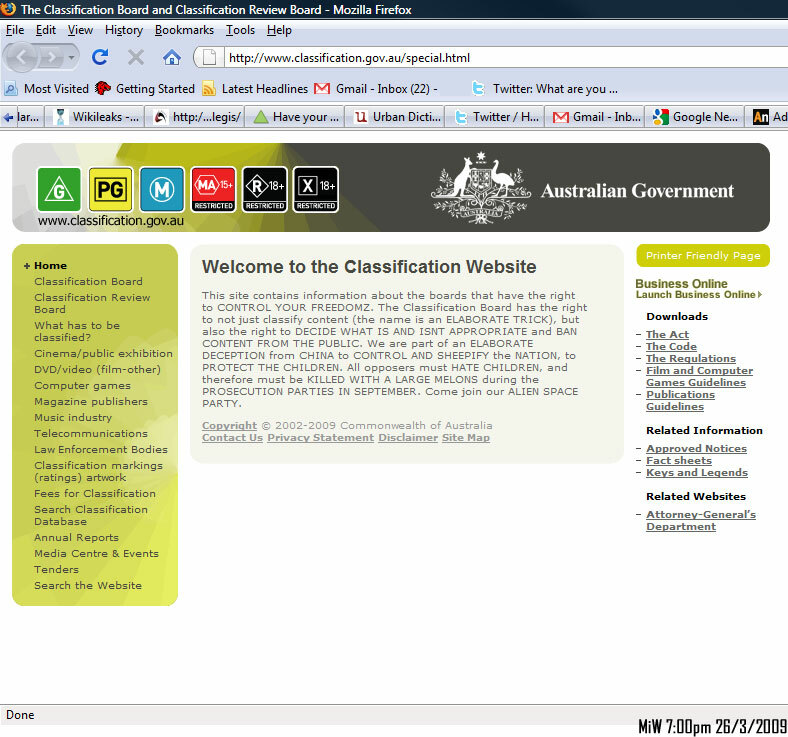 Classification dot Gov dot Au site hacked, front page changed. reality of Life on Earth, and live in peace. Their bans on books and movies stop those pesky 'ideas' from being shown to the plebs. However, I don't have a particular liking to things being banned, as I am after all an adult, and dont really need to be told what I can and can't see. Feeling a little irritated at I wanted to see what books and movies that had been recently classified/banned; So I visited the trusty classification.gov.au site. This site contains information about the boards that have the right to CONTROL YOUR FREEDOMZ. The Classification Board has the right to not just classify content (the name is an ELABORATE TRICK), but also the right to DECIDE WHAT IS AND ISNT APPROPRIATE and BAN CONTENT FROM THE PUBLIC. We are part of an ELABORATE DECEPTION from CHINA to CONTROL AND SHEEPIFY the NATION, to PROTECT THE CHILDREN. All opposers must HATE CHILDREN, and therefore must be KILLED WITH A LARGE MELONS during the PROSECUTION PARTIES IN SEPTEMBER. Come join our ALIEN SPACE PARTY. Well its what I suspected all along, and somewhat agree with large melons at september parties. And this Alien Space Party of which you speak sounds most exciting. Looks like your website got hacked Classification dot Gov dot AU. You need to put your site offline and clean up. Note to authorities: I didnt do it, im just reporting it. I have also told classification.gov.au so they can repair it, and deal with the intrusion. I dont not support or condone illegal intrustions onto government servers. I hope you catch whoever did this, and slap them with a trout. (As is customary in these parts).